If you are looking for a light, low calorie mashed potato recipe, this is not it! 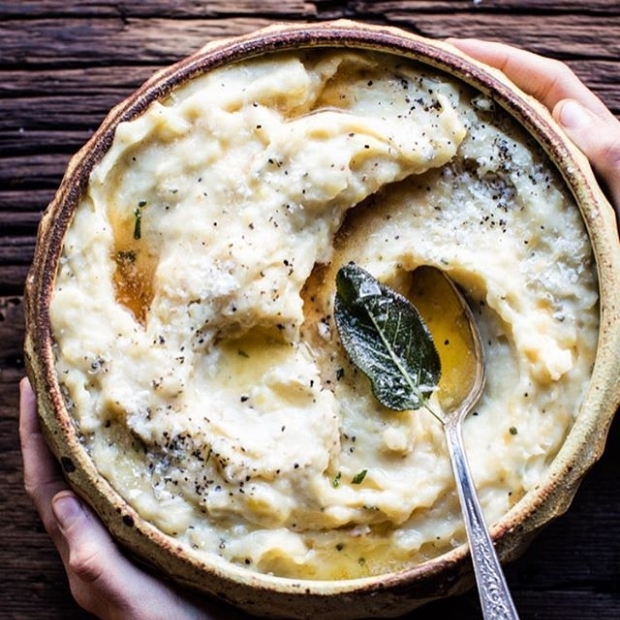 When it comes to holiday mashed potatoes, our philosophy is go big (with butter!) or go home. As for the mashing weapon of choice, use a ricer. It will make your potatoes lighter and fluffier. Mashing by hand can lead to gummy mashed potatoes, and no amount of butter can fix that! Place prepared potatoes in a large stock pot and cover by 2 inches with cold water. Add a very healthy dose of kosher salt to the water. The water should taste like ocean water. Place the pot over high heat and bring to a boil. Reduce heat to a simmer and cook for about 15-20 minutes, or until the potatoes are fork tender. Drain and add potatoes back to pot. Cook over medium heat for about 2-3 minutes, shaking the pan occasionally, to cook off any residual moisture. Add the roasted garlic cloves. Meanwhile, heat the butter and half and half over low heat until butter melts. Rice the potatoes (and garlic cloves) into a large mixing bowl. Slowly whip in the butter mixture, handling as little as possible. Fold in the crème fraîche. Taste. Add more salt if needed, and season with freshly ground black pepper. Add more butter, half and half and creme fraiche as you see fit.